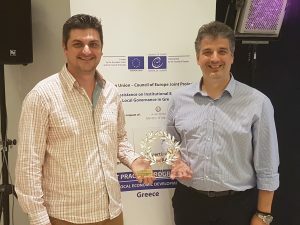 Earlier this year the Centre of Expertise awarded the Greek Best Practices on local economic development 2016-17. Improve my City proudly accepted two awards for the Thessaloniki and Thermi sites. The event took place in Chersonissos (Crete) as part of the European Union – Council of Europe Joint Project “Technical Assistance on Institutional Enhancement for Local Governance in Greece” supported by the Hellenic Agency for Local Development and Local Government (EETAA) and the Institute of Local Administration (ITA). We feel really proud for these nominations, which represent the hard work and dedication of the entire team towards realising our goal: making a city that serves the needs of the community. Congratulations to the Improve my City Team and our partners in the Thessaloniki and Thermi municipalities!